First, a disclaimer: unlike some of my tech-pundit peers, I don't claim to be uncannily prescient. Actually, I revel in the industry's glorious unpredictability. One of 2010's biggest stories involved a tech blog buying the top-secret, next-generation iPhone after an Apple engineer left it behind at a bar. In another, Microsoft canceled a much publicized line of phones two months after it introduced it. If you'd predicted either of these fascinating sagas a year ago, I would have chortled in contemptuous disbelief. That said, the short-term future isn't an utter mystery. Certain product lines follow predictable release schedules, some rumors come from reliable sources, and quite a few companies are already hyping hardware and software that won't show up for months. It's therefore possible to sketch out a fuzzy, incomplete  but still interesting  picture of next year's tech developments right now. Industry types keep referring to an alleged "tablet market," but for most of 2010, there has been only one real contender: Apple's iPad. Competitor No. 2  Samsung's Galaxy Tab  arrived in November. Early 2011 is when the deluge starts. The vast majority of upcoming tablets (like one from Motorola) will run the upcoming Honeycomb version of Google's Android operating system. HP plans one based on webOS, which it bought along with the rest of Palm in 2010, and RIM is cooking up a new software platform for its BlackBerry PlayBook. I'm looking forward to the flurry of competition even though I'm skeptical that any tablet-come-lately will shove the iPad out of the spotlight anytime soon. Right now, it seems entirely possible that 2011's most impressive advance on the iPad will be another iPad. Everyone is already assuming that Apple will release a second-generation model with a camera on the front for FaceTime video calls (and perhaps a second one on the back) by the spring. And guessing that the company will ship a new iPhone in June or July almost doesn't count as a prediction: it has done so every year since the first iPhone came out in 2007. Until recently, rumors of an iPhone on Verizon Wireless's famously robust network  which started, oh, 15 minutes after the first AT&T iPhone shipped  smacked of wish fulfillment. In early October, however, both the Wall Street Journal and the New York Times reported that one was definitely in the works for early 2011. If that timetable pans out, the phone is most likely to be a Verizonized iPhone 4, not an all-new model. But given the pent-up demand, it's still easy to imagine a rerun of the consumer frenzy that has accompanied every new iPhone release to date. Already, some phone watchers contend that smart phone is an insufficiently impressive description of the current crop of handsets; they advocate replacements such as supersmartphone and superphone. Which means we may need an even more impressive-sounding moniker for 2011's models. With higher-resolution displays, more potent dual-core processors, fancier cameras, faster wireless connections and better software  most commonly the next version or two of Android  they'll resemble truly pocket PCs more than ever. There isn't an iPod-esque breakout hit among the bevy of new boxes that let you watch Internet video on your TV, including the all-new Apple TV and devices based on Google TV. Hollywood, which has largely spurned Apple's 99-cent show-rental plan and actively blocked Google TV's access to major shows, hasn't helped. I still expect progress on the Internet-TV front by the end of 2011: slicker hardware from multiple companies, and more stuff to watch on it. Apple says that OS X 10.7 Lion will ship in the summer; it'll bring a more iPad-like interface to Macs, including the option to run apps in full-screen mode. Microsoft, meanwhile, has remained mum about Windows 7's successor, which probably won't hit shelves in 2011. But in its Microsoftian manner, the company will surely power up the Windows 8 hoopla machine long before it has a product to sell  perhaps as soon as CEO Steve Ballmer's keynote at the Consumer Electronics Show in early January. Mozilla's promising Firefox 4 was originally supposed to show up in 2010 but slipped into next year; I'm already using a late-beta prerelease edition as my primary browser. Later in 2011, we should also see the final version of Microsoft Internet Explorer 9, the first truly impressive version in eons. And Google updates its Chrome browser so relentlessly that it'll probably release several significant updates before 2012 rolls around. Google may dominate the Web, but none of its efforts to compete with Facebook and Twitter have amounted to much. (Its souped-up Twitter clone, Buzz, debuted in February, was briefly controversial, then pretty much disappeared from the public consciousness.) The company certainly has both the incentive and resources to keep plugging away at the social-networking challenge: it's reportedly readying something called Google +1  supposedly involving a toolbar that shows up across Google's array of services and enables Facebook-like sharing  for release early in 2011. The transition from 3G wireless networks to much zippier 4G ones is at such an early stage that carriers are still squabbling over what precisely qualifies as 4G. (T-Mobile says it's got 4G already; some of its competitors beg to differ.) Verizon now offers speedy LTE in 38 cities, but it still doesn't sell any LTE phones; and AT&T doesn't do 4G at all yet. The technology still won't be pervasive a year from now, but the odds will be much higher that you'll have access to a 4G network and the 4G-ready phone you need to enjoy it. 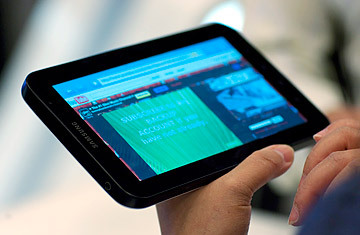 See the top 10 gadgets of 2010. See the all-TIME 100 gadgets.